Sure I have physical scars that serve as a reminder of days gone by. Some were made from stupidity, by accident and some were made by medical procedures. The scars I am talking about are the emotional scars on my heart. Hurts that have been healed and hurts that are still healing. There is One who has scars as well, His was for our redemption. His redeeming power can and will heal our wounds, making scars that we can hold dear to; as He holds His scars dear for us. What are some of these wounds/hurts? They come from a variety of events in our life. Healing those wounds is a process. A process we can not do on our own. A process that requires God. In order to gain complete healing that turns those wounds into scars we can hold dear. When you acknowledge to yourself, there is a wound/hurt that is in need of healing. Boldly take it to God in prayer. Depending what the circumstance is, you may to need to seek professional counseling and/or assistance. In all circumstances, you need to seek godly counsel. That could be a close, trusted friend, family, a church leader, or your pastor. Nevertheless who you chose to seek out, seek someone out. Get resources to help you. Follow through, Obey God and the instruction He gives. At times the process may be long. Sometimes the process will be short. No matter how long the process, Hold Dear to those scars. For they are a reminder of what God’s grace and mercy can do over your life. 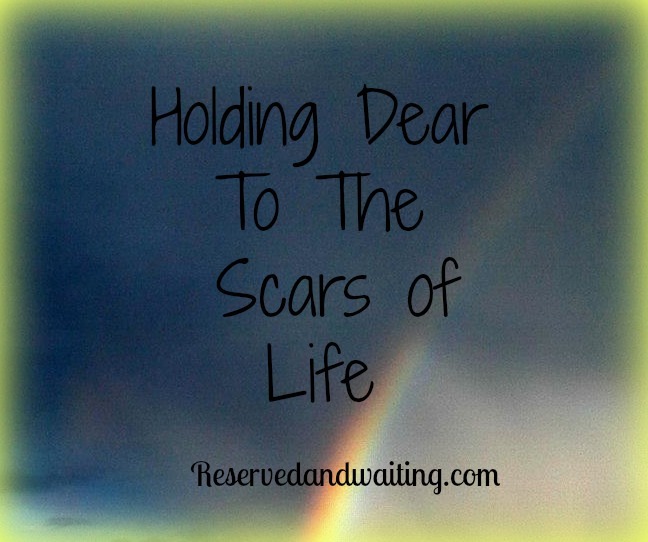 Are you holding dear your scars? What about wounds that are in need of healing?